Item shown above : Natural Hardwood in Cherry Finish with a glossy protective coat (basketball not included). 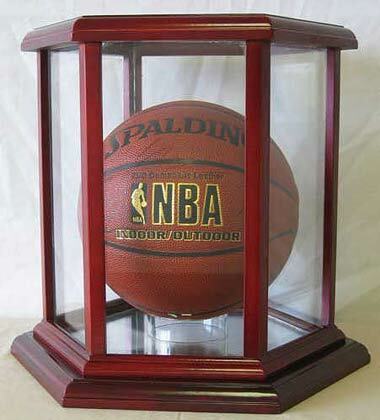 A great way to display your autographed NBA/College Basketball or soccer ball. Mirror on the bottom of the case to reflect light. Provide clear view from 5 angles. cover to protect from dust and damage. Ball holder is included. Made of Natural Hardwood. Fits NBA size or junior size basketball. No assembly required.